AWS is a beast of a platform that needs extensive knowledge of application deployment and cloud management. At last count, AWS had well over 100 services, and new ones are attached regularly. Each service has its jargon, own GUI, and own CLI command set. Mastery of any AWS service first needs a firm understanding of the basics. Without knowing VPCs, regions, AZs, and security groups, you are settled before even making started. Studying and repeating facts will only take you so far. If you are looking to get certified in AWS, you want to know your stuff. Let’s go through each AWS certification level, compare some opinions, and try to provide you a precise description of how difficult AWS exams are. Amazon Web Services is the leading public cloud services provider. AWS certifications are one of the commonly demanded certifications in the IT market. These certifications confirm one’s expertise on the AWS platform and thus, open the door to get many AWS jobs. Cloud Computing was the buzzword for 2018 and is anticipated to continue and increase in the upcoming year 2019 too. Cloud Computing has become popular. Earlier it was a proposal in the boardrooms and was limited to experiments. Ultimately, IT professionals with Cloud IT skills are in big demand. And as new credentials are rising, it’s high time for the IT professionals irrespective of their designation and aspiring individuals to jot down move progressively in 2018 about their career and its path. We have prepared AWS SysOps Administrator Associate (SOA-C01) certification sample questions to make you aware of actual exam properties. This sample question set provides you with information about the AWS-SysOps exam pattern, question formate, a difficulty level of questions and time required to answer each question. To get familiar with AWS Certified SysOps Administrator - Associate exam, we suggest you try our Sample AWS SOA-C01 Certification Practice Exam in simulated AWS certification exam environment. To test your knowledge and understanding of concepts with real-time scenario based AWS SOA-C01 questions, we strongly recommend you to prepare and practice with Premium AWS-SysOps Certification Practice Exam. The premium AWS-SysOps certification practice exam helps you identify topics in which you are well prepared and topics in which you may need further training to achieving great score in actual AWS Certified SysOps Administrator - Associate exam. The AWS SOA-C01 exam preparation guide is designed to provide candidates with necessary information about the AWS-SysOps exam. 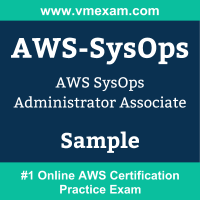 It includes exam summary, sample questions, practice test, objectives and ways to interpret the exam objectives to enable candidates to assess the types of questions-answers that may be asked during the AWS Certified SysOps Administrator - Associate exam. It is recommended for all the candidates to refer the SOA-C01 objectives and sample questions provided in this preparation guide. The AWS-SysOps certification is mainly targeted to the candidates who want to build their career in Operations domain and demonstrate their expertise. 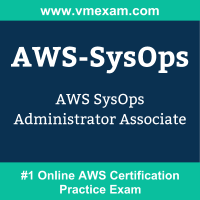 We suggest you to use practice exam listed in this cert guide to get used to with exam environment and identify the knowledge areas where you need more work prior to taking the actual AWS SysOps Administrator Associate exam. We are committed to helping you clear your AWS SOA-C01 Certification exam. You can easily pass AWS Certified SysOps Administrator - Associate using our online preparation platform which provides SOA-C01 practice exam. Our team of experts has designed this practice exam based on their 10+ years of experience in the Operations domain and expertise in AWS Technology. 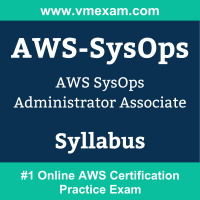 We have carefully maintained weights of AWS-SysOps syllabus topics, exam pattern, timed exam environment, and scoring system same as the actual AWS SysOps Administrator Associate (SOA-C01) exam. Our experts have included practical and scenario-based questions in AWS-SysOps practice exam; such questions are the most frequently asked in the actual SOA-C01 Certification exam. We believe in "The More You Use, The More Confidence You Gain", please try our sample AWS SOA-C01 practice exam to build the trust.